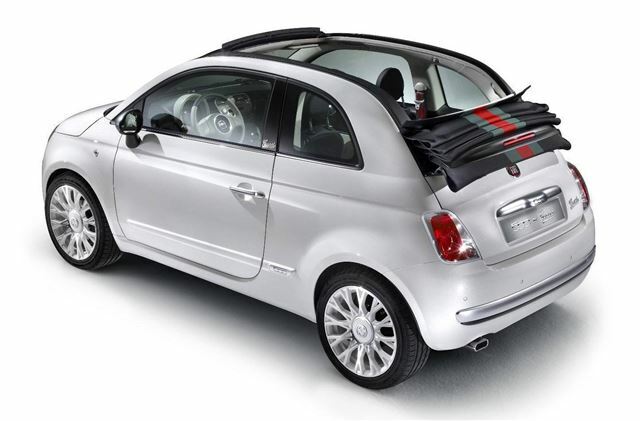 The success of the Fiat 500 500byGucci has prompted the firm to announce a cabriolet version. As with the hatchback, it's a tie-up between Gucci Creative Director Frida Giannini in collaboration and Centro Stile Fiat - the Fiat design centre. It's available to order through fiat.co.uk and selected Fiat dealers. Prices start at £17,800 OTR. It will be available in two sophisticated body colours: white with glitter and brushed chrome-plated elements, and black with glitter and shiny chrome-plated accents. For both, the soft top is black with the characteristic green-red-green Gucci web pattern printed lengthwise. Other exterior features of the Fiat 500CbyGucci include embellished by 16” alloy wheels characterised by a 'retro' spoke design. The hub caps have a double G logo in matching body colour, and Gucci signatures in italics are displayed on the tailgate and door pillars. Inside there's stylish stitching, exclusive materials, satin and polished chrome-plated elements, a velvet-effect finish on the radio panel, and two-tone Frau leather seats with Guccissima print. The Gucci web theme also appears on the seats, gearbox, key cover, mats, and, with an innovative finish, on the seat belts. Standard equipment includes automatic climate control system, seven airbags (front, side, window and knee), Blue&Me system integrated with rear parking sensors, car radio with CD-MP3 player and leather steering wheel with radio controls.